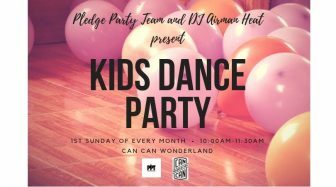 The Pledge Party Team & Pledge Empire Records produce this fun, popular kids dance party the first Sunday of every month! DJ Airman Heat will keep your kids dancing all day with the favorites in kids dance songs. Fun for all ages! Kids under 12 are free. $2 for those 13 years and up. *Please be sure to visit our website, www.cancanwonderland.com, for the most up-to-date information.